I couldn't get out of my car after commuting to class, and three chiropractic appointments, 2 massage and a Trigger Point therapy session later - I was convinced try a Proprioceptive Deep Tendon Reflex (PDTR) technique in a session with a friend. They used the muscle testing and neurological challenges process to reset the proprioceptive dysfunctions by simply using this 'stretch' throughout the body. By looking at dysfunctions in general as different groups (structural, nutritional, emotional, electrical) , the therapist can start out and assess a faulty neurological signaling patterns in the Nervous System (NS) before they become physical problems. The physical body cannot be healthy unless the Nervous System (NS) is functional. What Is P-DTR® And What Does It Do? PDTR® is not pain management. It doesn't manage pain, it simply eliminates it in a two part process - - it corrects dysfunction in muscles, ligamentsor tendons AND disrupts the pain signal from the brain. This is successful, because it sends a new message to the nerve endings via different stimuli, such as rubbing or tapping. (See below how a typical session works). 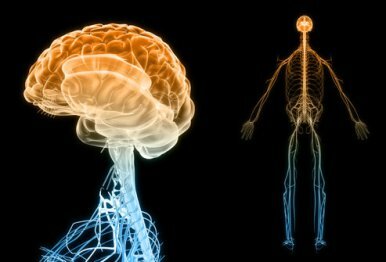 This treatment may seem strange in the grand scheme of traditional medicine, but it provides a new code to the brain that says: "Everything is ok now. You can stop with the pain and the signal for correction". You have probably unconsciously provided a message like this to the brain yourself in the past - A good example is rubbing your stomach when you have a belly ache). Excellent for trauma, injury, pain, scar tissue, emotional dysfunctions, muscles dysfunctions, reoccurring problems, chronic issues, etc. Active Isolated Stretching (AIS) is a technique that lengthens and strengthens muscle tissue. Our muscles have two major functions: to contract or relax. The idea of AIS is to hold a stretch for one to two seconds, relax, and then repeat the movement for 10 to 15 times for one to two sets. When the stretch is done right, you should be able to increase your range of motion with each additional set. AIS focuses on the fascial chain - and then isolates the individual muscles that are being moved. Fascia is a complex, interconnected fibrous matrix that runs throughout the entire body — surrounding not only our muscles, tendons, ligaments, bones, and joints, but also the sensory organs of the nervous system, blood vessels, and lymph channels. Over time, AIS work can remodel fascia that has become distorted due to injury, aging, physiological imbalances, or other factors. AIS helps to break down scar tissue in fascial sheaths and reduces the risk of future fascial strains. The benefits of incorporating AIS into your routine are numerous: increased isolated flexibility, realignment of the body, reduced chance of injury and better awareness of your body. Try the following routine four to five times a week after your runs.